A bill of sale, also referred to as a “purchase and sale”, is a document that establishes the details of a transaction between two (2) parties, Buyer, and Seller. 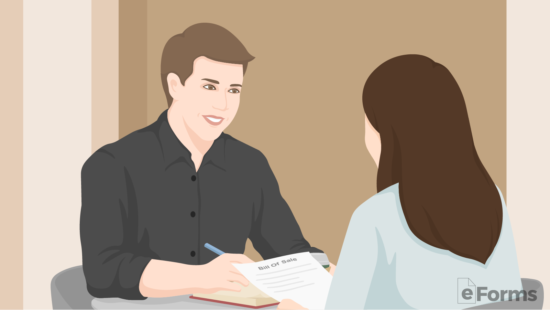 The form is usually very simple stating the financial terms of the agreement followed by the signature of the seller (buyer’s signature may not be required). The monetary funds (such as cash or certified check) should exchange hands at the time of purchase (which should also be dated in the bill of sale). A Bill of Sale is most commonly used as a legal contract when conveying ownership of a motor vehicle. Use the following instructions to coordinate a successful transfer as the Buyer or Seller. Once you have decided whether to buy or sell a specific vehicle, you will need to enter the terms of the agreement. If the vehicle is being sold for cash, the entire amount will be due at the time of sale. Any financing will have to be done prior with a local bank or credit union. If the vehicle is being sold for cash and trade, both vehicles and the terms of the transaction must be stated (common for vehicles purchased from dealers). The Buyer should obtain the Vehicle Identification Number (VIN) of the motor vehicle. This number is unique to every automobile, consisting of 17 characters. It’s usually located on the driver’s side windshield or inside where the door meets the vehicle. 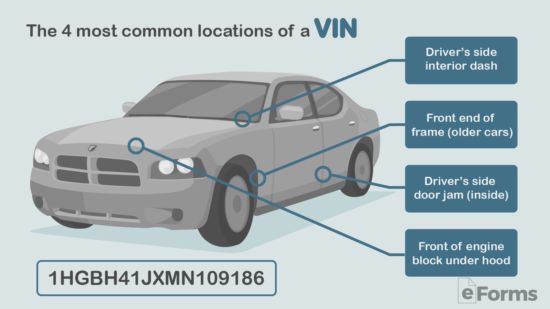 If you are unable to find the VIN number, you can always find it on the vehicle’s Title or Registration. When obtaining this number, you can see all the repairs that were ever done during its existence including car accidents, water damage, and ownership history. CarFax.com – Get a detailed report for $39.99. VINcheckpro.com – Get a limited free report. Private Inspection – Remember, only the damage that gets reported to an insurance company gets mentioned in a VIN lookup. Therefore it is recommended to have a third (3rd) party mechanic inspect a vehicle to ensure it is in proper working condition. 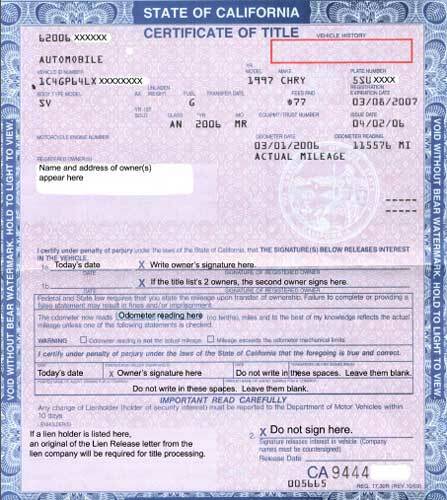 Title and Registration – In order to complete the sale, the Seller must provide the Title and Registration to the vehicle. 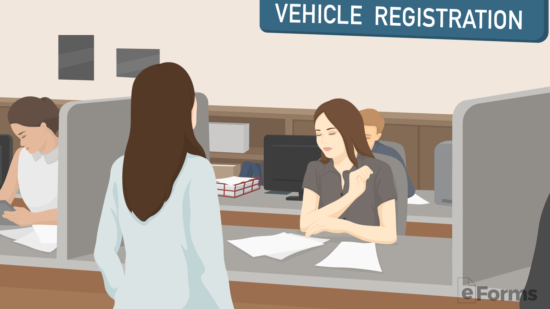 If the vehicle’s Title is missing, you can request a new Title from a DMV office which can take about 10 to 14 business days to obtain. Vehicle Bill of Sale – The legal contract between a Buyer and Seller that details a transaction between the parties. The form should only be signed by the Seller when the funds have been transferred in-person or by via a bank transfer. View Instructions. Odometer Disclosure Statement – According to federal law all vehicles that are under 10 years of age and below 16,000 pounds must have their odometer be verified by the Buyer. The Seller must acknowledge on the form that to the best of their knowledge the reading is accurate and that the mileage has not been defective. Photo ID – Due to the amount of Craigslist and newspaper scams, it is highly recommended to obtain a copy of the Seller’s photo identification (such as a driver’s license). This is to be 100% sure that the person authorizing the bill of sale is able to legally sell the property. The Buyer should make certain that the title and identification match accordingly. Document Signing – Once all the necessary papers are drawn up, the sale may be completed. The parties should meet at a mutual location with the Buyer bringing the funds and the Seller bringing the vehicle. At this time the Bill of Sale should be signed by both parties and the Title should be signed over. Sales Tax – Lookup the sales tax in your State. Depending on the laws the Buyer or Seller will be responsible and this must be paid at the time of sale. Bill of Sale – The original that was signed by the Buyer and Seller. Title – A new Certificate of Title will be issued and sent to the Owner within 30 days. Odometer Disclosure Statement – If the car is younger than 10 years and under 16,000 pounds. Proof of Car Insurance – Usually an insurance card is suitable. Fee(s) – There is a tax or fee charged in every State. Once the vehicle has been registered the buying process is complete. Not every state requires you to complete a bill of sale when finalizing a vehicle transaction. However, no state prohibits you from completing a bill of sale either. Even though many states do not require a bill of sale, they still offer an official form (therefore, it’s recommended to complete a bill of sale even if it’s not required in your state) which we have included below. For states that require you to use their specific bill of sale form, we have also included below. For more information regarding your vehicle or a bill of sale, contact your nearest DMV Office. IMPORTANT: A Bill of Sale does not transfer Ownership of Title, it only shows proof that a transaction took place. You must sign over the Vehicle’s Title in order to transfer ownership. State DMV Locations Vehicle Bill of Sale Bill of Sale Required? For as simple and straightforward a Bill of Sales can be, it’s important to familiarize yourself with the language found in your document. As-Is – A statement or clause within a bill of sale that states that the item is being bought or sold in its current condition, whether new or used, and that that the Buyer is accepting the item with all its faults. This protects the Seller and prevents the Buyer from coming back after a completed transaction with claims against the item. Buyer (Purchaser) – The person in the transaction who pays money in the return for an item. Gift – The act of giving an item to the “buyer” with no compensation in return. Notary Public – A disinterested 3rd party public officer who can attest to the signatures of the Buyer and Seller. You can find a Notary Public at your local bank or by using a professional service. Payment – The money used to pay for an item in a transaction. Seller – The person or party in a transaction that is offering an item for purchase. Trade-In – A type of transaction that starts with the buyer offering an item to the seller in equal exchange or at a discount for the Seller’s item. This type of transaction is commonly practiced in the car business when the buyer wants to trade in their used vehicle for another vehicle sold by the seller. Vehicle Identification Number (VIN) – A unique 17 character code consisting of numbers and letters which is essentially the “serial number” of a vehicle. The VIN must be written into a vehicle bill of sale in order for it to be valid. 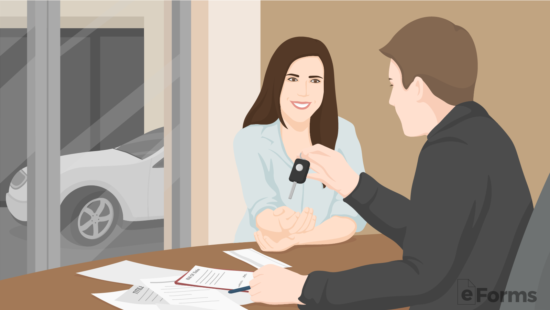 Do I need a Bill of Sale when selling my car? Depending on which state and sometimes even the County you are located, a Bill of Sale may or may not be required. By adding an extra layer of protection for the Seller, this document should always be included and completed when a vehicle transfers ownership (View State Requirements). How do I prevent disagreements from the Purchaser after the sale? Preventing future disputes between the Buyer and Seller is mainly a reason for a Bill of Sale, therefore it’s important to input as many details as possible to maximize the effectiveness of your Bill of Sale. Adding and completing a Certificate of Acknowledgment will further strengthen the power of your Bill of Sale. What is the difference between a Sales Agreement and a Bill of Sale? A Sales Agreement is categorized as a contract and allows you to enter more detailed information pertaining to the sale of goods and services. A Bill of Sale acts more as a receipt (proof of purchase) and does not necessarily hold any contractual bearings. Does the Buyer (Purchaser) need to sign the Bill of Sale? Due to the varying laws within each state pertaining to this issue, it’s important to check your local laws if you decide to not have the Buyer sign the document. When possible, it’s always best to have the Buyer sign the Bill of Sale. 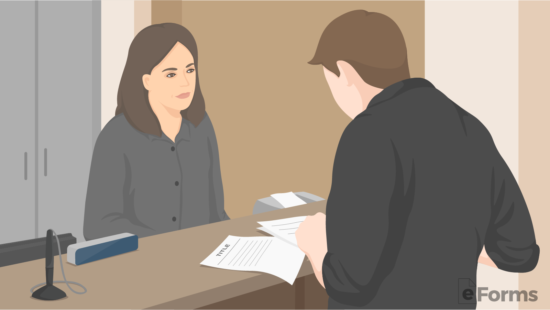 When do I deliver the Bill of Sale to the Buyer? Typically after paying for an item, you receive a receipt showing proof of your purchase. A Bill of Sale should work in the same way, by only delivering the Bill of sale after payment has been received by the seller. When would I need to use a Promissory Note? The only time a Promissory Note should be used is when the Buyer does not have enough funds to pay for the Seller’s item in full at the time of purchase. By issuing a Promissory Note, the Buyer promises to pay over a period of time for the Seller’s item. This example shows you how to fill-out and complete a Motor Vehicle Bill of Sale. If your state requires a bill of sale but does not provide it for you, this is the form you would need when buying or selling your car. There are only 3 ways in which your transaction can go; a payment, trade-in, or a gift. Check one of the 3 possibilities. If the transaction is by Payment or Trade-in, you must enter the vehicle’s information such as the Make, Model, Body-type, Year, Color, and the miles on the Odometer. If the vehicle is a Trade-in, enter the vehicle being received. The VIN number (Vehicle Identification Number can be found on the vehicle’s title, registration card, and even the owner’s manual. It shouldn’t be that difficult to find. You will know you have found the VIN if all the letters and numbers add up to 17 characters. Enter the 17 character VIN. Taxes can either be included or excluded from a sale, checkmark the box accordingly. Enter terms and conditions of the sale. For example, The sale will not be complete unless the ski rack is attached when the car is sold. An odometer disclosure statement is required by federal law when transferring ownership of a motor vehicle. The Seller’s Name and an accurate mileage count read on the odometer must be entered. If for some reason, possibly due to a faulty odometer, the mileage count is not accurate, select the appropriate checkmark.